Free Ethereum Spinner App Review: Is it Legit or Scam? 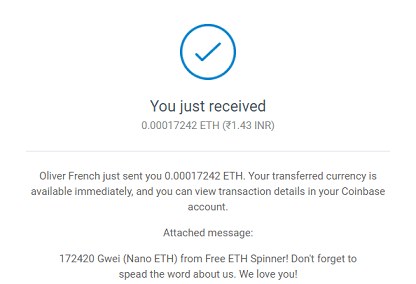 Free Ethereum Spinner is a make-money-app that lets you earn Gwei. it is a smaller unit of Ethereum(ETH) cryptocurrency(like penny is denomination for dollar). Free Ethereum Spinner is the only app(that I know of) that tells you straight up that you'll be seeing a lot of ads. I've reviewed and tried so many apps and many of them rely on ads for their income. But they leave the figuring out part of seeing a lot of ads to the users. But not Free Ethereum Spinner it lets you know what you are signing up for. Read: StellarFaucet: Free Stellar Lumen App Review: Is it Legit? The developers are being honest and that's something I appreciate. Before you can register you'll need to create a Coinbase wallet. After sign up, You’ll see the following screen. You’ll have a filled energy bar. 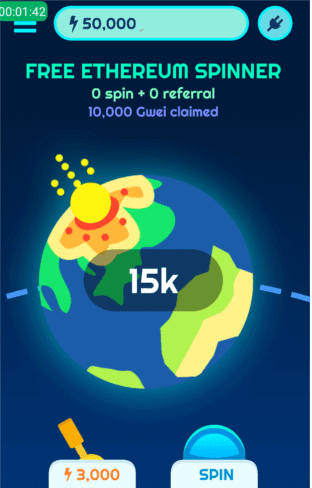 Now all you have to do to earn Gwei(nano ETH) is choose the energy you want to bet and hit the Spin button. You’ll win whatever amount the wheel stops on. As the app told you, an ad will be displayed after every spin. Which I didn't find annoying as they can be skipped/closed. You can spin the wheel and earn free Gwei as long as you have energy. To refill the energy bar you can either complete offers and watch videos or let it replenish on its own. It takes around 5-7 hours. The energy is capped at 50,000. You can redeem your earned Ethereum to your Coinbase wallet. There is no minimum payment threshold but you can only withdraw once every 3 days. You can refer your friends and earn 5% of their earnings. Do you know any other apps like this?